There are a lot of things a miss about Kolkata, and mishti doi comes quite on the top of the list. The creamy delicacy served in earthern pots is a food connoisseur’s dream. To set a perfect bowl of that yummy yogurt is a task to master. And, even though you master it, it’s really a time consuming job. 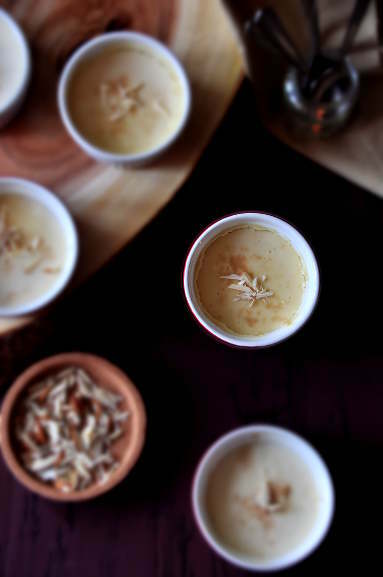 If you are really missing mishti doi or don’t have time to set a whole big bowl of it for your next party, the bhapa doi is your answer. The bhapa doi looks and tastes exactly like the store bought mishti doi, yet it’s not very time consuming and sets perfectly. The only con about this recipe is you need to have a oven. I never tried it making it in a pressure cooker, like baking cake in pressure cooker, but I’m sure that can also be done. I have added brown sugar to make it extra sweet, if you want you can also omit it. Also, once the doi is all set, just before serving you can pack the top with a thin layer of sugar and caramelize it with a blowtorch and make it into a bhapa doi brule. If you don’t have a blowtorch handy, you can place the bowl/ramekins in a large roasting pan, pack it with ice. Then place the bhapa doi topped with sugar in a broiler for about 2 minutes, or till the sugar melts. Mix everything other than the almonds in a large bowl, use a hand held mixer if you have, once mixed it will have a consistency of this pancake batter. Pour the mixture in a large oven proof bowl or in separate ramekins. Place the bowl(s) in the oven for 25 mins. Depending on the oven you can keep the doi for a little longer or a little less; before taking out make sure the doi is set and not wobbly. Take them out and let the doi cool down. keep it in the refrigerator for at least 4 hours, better overnight. Sudeshna, janina tor amake mone ache kina… ami satarupa (somadri’s wife) just wanted to let you know that your recipes are awesome… i have tried a lot of them and have successfully nailed it…will try this one as well ..i really miss mishti doi… thnks for posting this one…tk cr and keep cooking !! !